In ‘Virtual Light’, William Gibson’s novel of the near future, social science researcher Yamazaki carries a small notebook device. When he talks to Skinner-san, one of the squatters who turned the earthquake-wrecked Oakland Bridge into a home, he flips on the notebook’s Record function. Not only does it cope passably well with Skinner’s idiomatic and fractured English, it near-simultaneously turns it into Japanese text! The ‘future year’ of Gibson’s story was 2005. Nearly fifteen years later, we don’t yet have a device that can do this, though Alexa and Siri are getting quite good at listening. Meanwhile, when we sit in a meeting or listen to a lecture and want to capture the memory for posterity, audio is always our main starting point. Therefore, audio recording can help make memories. In this article, I’ll share from 40± years of using audio recording as a memory supplement, and sometimes as direct evidence. I shall focus on the kinds of recording, and uses of recording, most pertinent to the work of a parliamentary assistant or researcher. I am not going to deal with clandestine sound-thievery; I’ll leave that to Le Carré (especially his recent fine novel ‘The Mission Song’). I’m also only obliquely mentioning video recording. I’m going to start, not with technology, but with a few use-case scenarios I have experienced. 1. An aide-memoire, to capture what was said. A small company with three partners recently held its first Board Meeting. 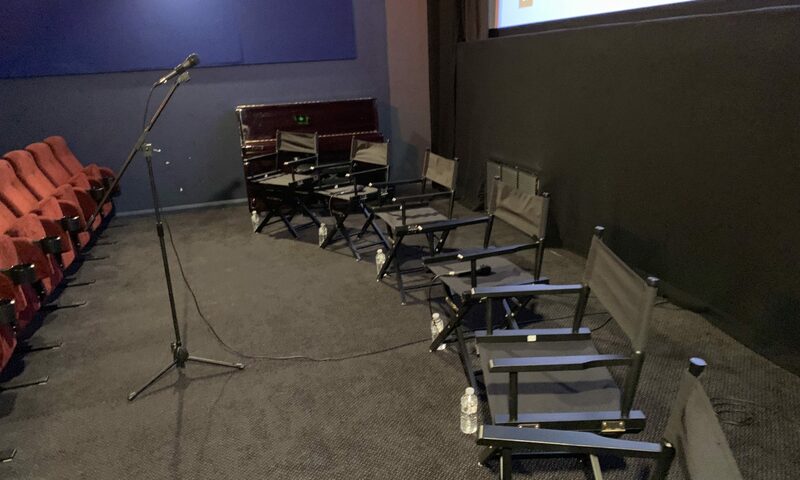 The Directors had a lot to tell each other in 90 minutes, and no-one wanted to be distracted from participating by having to take notes. They got me in to audio record and take notes, and allowed me to interrupt and ask for clarifications of technical abbreviations, etc. Afterwards, I prepared draft minutes under a Non-Disclosure Agreement (NDA). 2. Similar aide-memoire, but to produce a more literal account. I was brought in to record a five day training course. The course leader, a guru in knowledge management circles, speaks without notes and uses much anecdote. He needed to capture this, to help prepare materials for other trainers. The room was moderately large, with 20 participants and trickier acoustics. Afterwards, when making a near-literal transcription with added commentary, I had access to his teaching slides, and patched images of them into the written account. Five days generated a document an inch thick! – and took about three weeks to prepare. I also get asked to video meetings, which I won’t describe here, but I must say that the need for a high quality audio component is something amateur videographers often forget about. 5. Rehearsed audio capture for a ‘broadcast-style’ podcast. Here the aspiration is for the best quality audio practically attainable. Preparing narrative voice-over for a video programme is very similar. A redeeming feature of this scenario is that if the speaker fluffs his or her lines (which are usually scripted), you can do a re-take, and it all comes together in the edit. You will notice that in the first three of these scenarios, the desired output is in text form. The recording doesn’t have to be that great, and you can put up with some background noise, so long as you can make out what is being said. Indeed in the first case, a smartphone plonked on the table might be all the recorder you need. A recent article in TurboFuture by teacher Jonathan Wylie gives helpful purchasing tips for suitable external microphones, and also explains alternative ways of connecting mics to iOS, such as via the headphone port or even wirelessly (by BlueTooth). (https://turbofuture.com/consumer-electronics/External-Microphones-for-iPads-Better-Mics-for-iOS-Audio). There are several apps for recording on an iOS device, such as the freeware Recorder Plus or inexpensive HT Professional Recorder. Seven such apps are reviewed at SysTweak: https://blogs.systweak.com/2018/02/record-your-voice-now-with-these-7-best-iphone-apps/ A similar advisory for Android is at https://www.scriptosphere.com/5-best-audio-recording-apps-android/. If text is what you are ultimately after, what’s your alternative to Yamazaki’s magic notebook? Speech-to-text systems are improving: my friend Yuri wrote his entire PhD thesis using Dragon NaturallySpeaking software, while unable to type because of carpal tunnel injury. But, he had to train the software to recognise his voice, and he dictated clearly and in a quiet home office space. Précis. Saying the same stuff, but in shorter and more direct language. Cutting out irrelevance– which can include asides, false starts, lame jokes. Boosting comprehensibility– expanding abbreviations, disentangling excessively obscure jargon, adding references to documents and Web sites. Adding graphics and tables that explain matters better than words can (my Horrocks lecture example illustrates this). Until recently, doing transcription could be quite literally a pain. The Museum of Childhood ran an oral history project years ago, in which half a dozen volunteers conducted interviews with local elders using small MiniDisc audio recorders. Strangely enough, none of the volunteers fancied doing the verbatim transcriptions! – it fell to me. It was interesting work, but took a long time, and constantly reaching out to my MiniDisc machine to press the pause, play and scan-back buttons wrecked my shoulder. Notice that in my scenarios 4 and 5, the ‘deliverable’ will be audio itself, so sound quality matters. If you will do a lot of this, you might want to get a professional digital audio recorder for a few hundred quid, and a selection of microphones. A reasonable analogy here is with buying a digital SLR camera with interchangeable lenses fit for various purposes (wide-angle, telephoto etc). they offer a range of recording quality settings, including industry-standard audio file formats such as .WAV and .AIF, which are oriented towards editing. Professional-quality microphones divide into Dynamic and Condenser types. In a dynamic mic, sound vibrates a magnet inside a coil of wire and the mic generates its own electricity. Dynamic mics are robust, therefore favoured by performing artists, but let’s ignore them because you generally get better sensitivity out of the other sort. Condenser mics require electricity, often supplied by a simple battery. But many must be powered through a shielded three-wire XLR microphone cable; this is called ‘phantom power’, and the serious recorders I have just outlined will provide that. So do mixer desks, which I’ll introduce in a moment. Directionality is another key variable. To record a lecture, I deploy one or more mics of the type called ‘cardioid’, which means their pick-up sensitivity is heart-shaped – strong at the front, less so at the sides, and deaf to what is behind (e.g. the audience). For face-to-face interviews, I use a matched pair of small cardioid mics, plugged into the Left and Right inputs of the recorder. I also pack a second-hand ‘short shotgun’ mic. This is less menacing than it sounds, though it does have a gun-like appearance. Such a mic is highly directional and just the thing for video work – or for keeping track of speakers who go walkabout from the podium. In addition I have an ‘omnidirectional’ mic, the wide-angle lens of the audio world, popular for news-style interviews. There are lapel mics, radio mics – the list goes on. ‘Avoid distracting background noise if possible’ is the obvious tip, but not always easy to attain. You get less background noise by placing the mic close to the speaker’s mouth, and trimming back the recording level to match – but I don’t generally recommend it, because people without microphone discipline can’t keep a constant distance from the mic. ‘In the wild’, better keep the mic at arm’s length and increase the recording level a bit. Some mics are very sensitive to external vibration e.g. from people tapping on the table, walking across the floor etc. If possible, get an elasticated ‘shockmount’ for the mic (see photo). To cover larger events (scenario 4) I need to blend inputs from several microphones, and sometimes line-level output from the venue’s PA system – and I want instant finger-tip control to balance these inputs. A portable mixer desk can be a godsend. My battered old Alesis fits in a rucksack, feeds mics with phantom power, and doubles as a computer audio interface (USB), which means I can record straight to my laptop hard disk without needing the Marantz recorder. For scenarios 4 and 5, the captured audio benefits greatly from various kinds of editing: snipping out unwanted and embarrassing bits, boosting volume on quiet bits, squashing the background hum of air conditioning, and so on. Whether on Mac or Windows, you can do all this with Audacity software, which is free and Open Source. Here, the basic rules are to work with the best quality input you can capture, edit and save in uncompressed audio formats such as .WAV – and then use a compression utility to make much smaller MP3 files for posting on the Web. Now you’re a radio star! Many digital audio recorders costing a few hundred pounds, like the Marantz PMD-661 shown on the right, can be fed audio signals from a variety of sources. 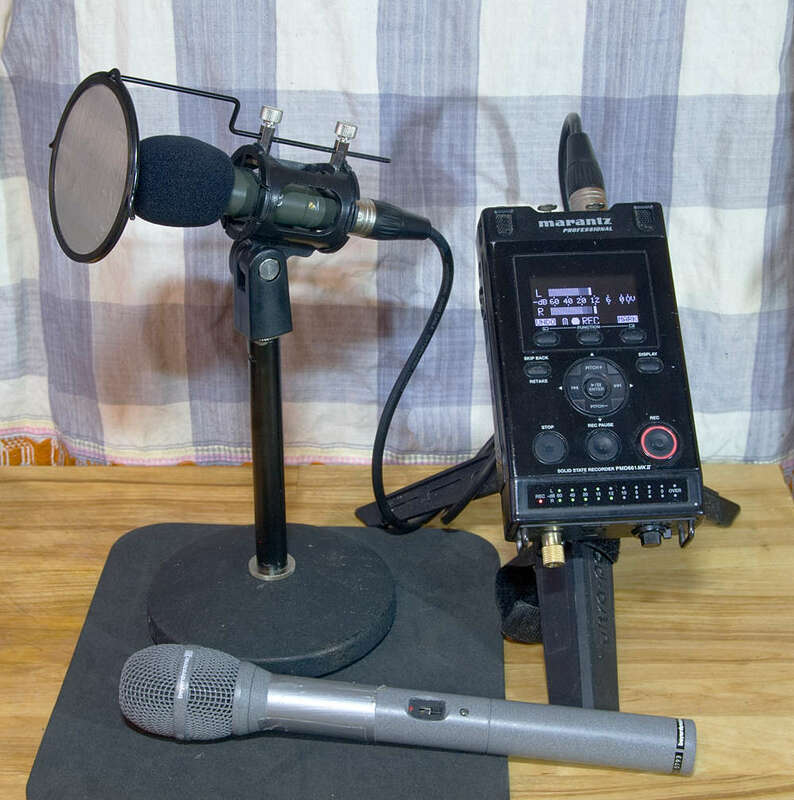 Here it is set up to record from a small sensitive directional microphone, getting its power from the recorder through the thick shielded XLR cable. The microphone is held between rubber bands in a shockmount housing atop a desk-top mic stand, so that knocks against the table won’t travel up into the body of the mic (sitting the whole thing on a mouse-mat also helps!) The mic is further protected against the speaker’s breath by a foam cap and metal mesh ‘pop screen’. The microphone at the bottom of the picture is designed for rougher handling and a different kind of recording context: its recording capsule, powered by an internal battery, is cradled in an internal shockmount. This microphone is omnidirectional, and has an extra long handle to reach out to an interviewee in the street. Conrad Taylor is an independent writer, teacher and media worker.